A tiny tool tutorial (totally!) - Stop staring and start sewing! Sorry for the long absence. I've been completely swamped between summer with the kids and sewing for my little etsy shop. I've finally drawn a winner for Joanna Figueroa's beautiful new book. It's Allison who said "It is a toss up between Pink Floyd and Prince!" Congratulations Allison! :) I'm so glad I asked everyone to name their favorite band because it was so much fun to read all of the comments. I've been wanting to share a little tool I've been using a lot lately because it was such a simple way to fix (improve) a pesky problem. My pesky problem is I have 5 kids and they like to break my stuff. Always. 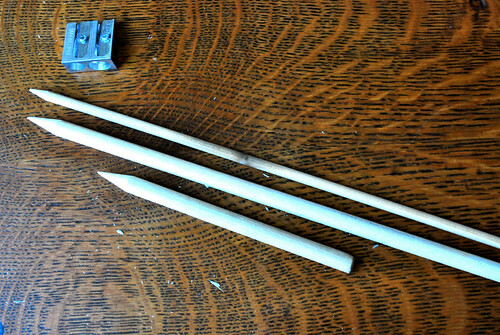 But I digress....I had a wooded dowel in my sewing room that my boys (not sure which one) had snapped in half and I was using the snaggled end for turning corners and trying to get nice, sharp points on my little bags that I've been making. Well, Joey took pity on me and said "Let me try something here" and took my dowel and gave me a great turning tool in return. So I'm going to show you what he did.... Here is a 5/16" dowel which you can get at any craft store or Home Depot. They cost under a dollar and you probably have one lying around somewhere. I took a saw and cut about 5 1/2 inches off of this one (they come in 36"-48" lengths). You can probably just use a pair of pruners from your gardening supplies too. I sharpened it in a little pencil sharpener and bang! I have a nice little corner/point turning tool. You can make a bunch of different lengths off of just one dowel so you can reach all sorts of tight spots. Joey even made me one out of a super skinny 3/16" dowel for tiny projects. Anyway, I know this is one of those "duh" projects but it has really made things easier for me and eased the pain of my kids losing the dowel that came with my turning tool kit (but that had a blunt end and this is so much better!). I hope you're having a great summer so far! It's hotter than heck here, or course, but I managed to get an above ground pool for the kids and it's been a real life (sanity) saver. Keep on sewing!